YI YI / Every finished product is fully assessed before delivery, and all of our materials and components are RoHS compliant. Every finished product is fully assessed before delivery, and all of our materials and components are RoHS compliant. 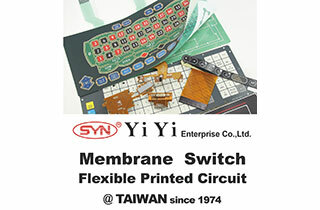 Yi Yi Enterprise CO., Ltd. is a leading technology manufacturer of Membrane switches, Flexible Printed Circuits, Printed Circuit Boards, EL Panels, Name Plates and Silicon Rubber Keypads, with our headquarters and factories established in Taiwan, we export 70% of our production worldwide, with US and Europe being our main customers and the rest 30% of the production remaining within Taiwan. The product is assembled with aluminum hardware and contains a transparent, abrasion-resistant window. The textured overlay is anti-scratch. We can offer customized design and SMT service for our customers. Attached metal domes and LED are optional. Any shape angle can be applied, and OEM and ODM services are acceptable. There is very low power consumption when the backlight is on. The EL panel only uses 0.1 ~ 0.2mA/cm², and the life time of the product is greater than 10,000 hours. Copyright © 2019 Yi Yi Enterprise Co., Ltd. All Rights Reserved.